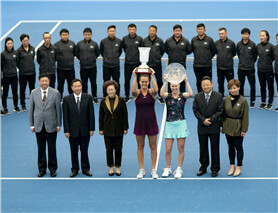 The 2019 WTA Shenzhen Open was held at Longgang District Sports Center Gymnasium from Dec. 29 to Jan. 5, gathering world famous tennis players including five-time Grand Slam singles champion Maria Sharapova, 2017 Roland Garros Singles Champion Jelena Ostapenko, and renowned French player Caroline Garcia to compete for a grand prize of US$750,000. I really like to be in China. (Shenzhen is) a nice city, nice people here. The condition here is top-level. Everyone here is so friendly. I feel like at home here. I don’t know why, but China is something special for me. China is now a place where tennis is more and more popular. Shenzhen is becoming a tennis city. In the next ten years Shenzhen is the city for the top eight last tournament masters (WTA Finals). China is probably No. 1 right now for coaches. If we put everything on the paper including conditions, environment, facilities, and salary, China is honestly No.1. I am very much an open book. I travel and I want to share places I go to. I hope that one day they get to see them as well. Maybe I can give them some tips on whatever, whether it’s a dish at a restaurant or other things. I woke up super early this morning and all the efforts paid back. I saw Sharapova in person. I hope she will play well each ball and enter the final. The city is beautiful. Shenzhen is actually very lucky to host the first tournament of the year and the last. It’s a very nice feature to have these huge events in the city.